A series of new food outlets will open at the opposite end of the centre to intu Watford’s extension, along Ketts Mall near Gourmet Burger Kitchen, with construction work starting from February. 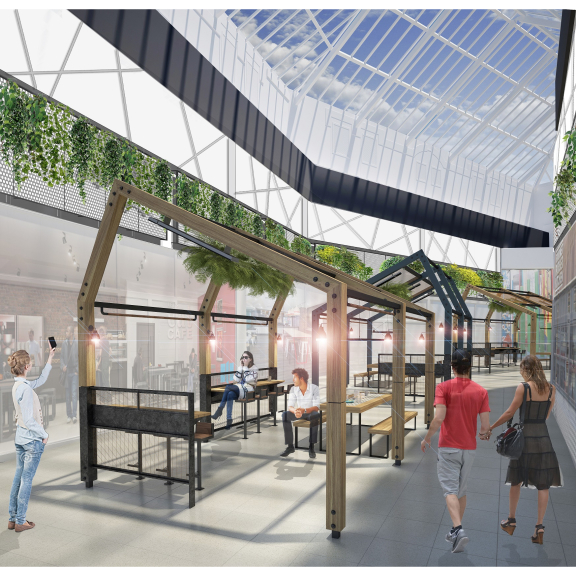 The redesigned interior will transform the space into a relaxed, communal dining experience featuring giant pods where groups of friends, family members and the high number of office-workers in Watford will be able to enjoy a bite to eat together. Five new grab-and-go caterers will take space there to further enhance and complement the centre’s casual dining experience. With nearby brands like John Lewis and the popular climbing operator Rock Up, the new area will create a strong retail and leisure mix at both ends of intu Watford. The £1 million investment follows the launch of the stunning 400,000 sq ft extension which has introduced new restaurants, such as Yo!Sushi, TGIs and MOD Pizza, leisure operators, including IMAX Cineworld & Hollywood Bowl and stores from a three-storey Debenhams to H&M, Superdry and Jack Wills. It has created a day out destination and has promoted Watford into a top 20 retail location in property consultancy CACI’s national ranking. The rest of intu Watford has also undergone a £13 million refurbishment programme with work to replace flooring, ceilings and lighting and refurbish the centre’s car parks and toilets. intu Watford’s extension continues to open new retailers in 2019 and will see the likes of Cote Brasserie and bar and restaurant brand The Florist open, plus more to be announced.